The Veterans One-stop Center is proud to partner with American Red Cross to present Operation Give Blood: Enlist to Save Lives. Let’s put the power of veterans and the community into action and help save lives this summer! Each pint of blood we collect will help save up to three lives and touch the lives of so many more. It’s a great way to pay it forward and make an impact on people in our community and across the country. We are very excited about this partnership. We ask for your full support. Please give blood at our drive on June 14th, which is also Flag Day, from 1:00 pm to 7:00 pm at the Union Road Donation center located at 3637 Union Road in Cheektowaga. Our goal is to collect 50 blood donations. Even if you cannot donate blood yourself, you can still help by encouraging friends, family and coworkers to donate. 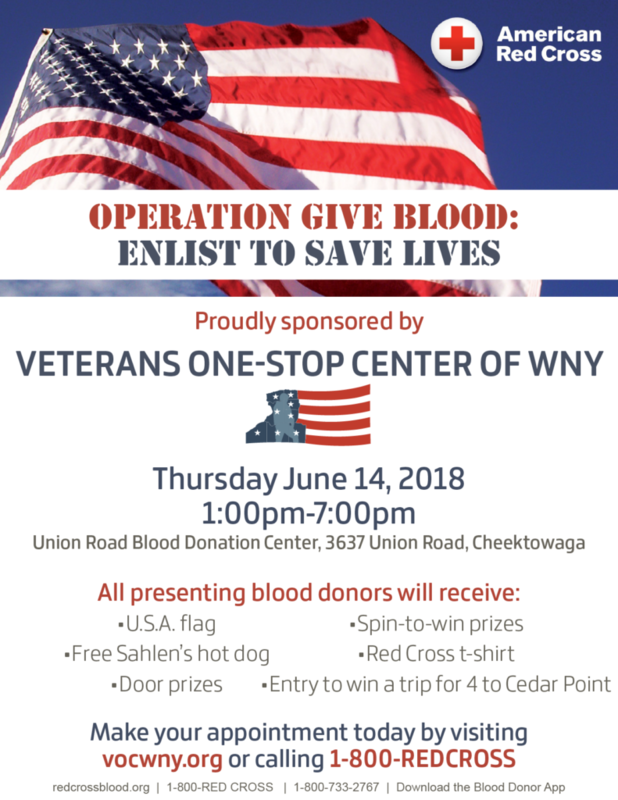 As part of the challenge, we will be providing a U.S.A. flag for each donor, a Red Cross t-shirt, delicious Sahlen’s hot dogs, valuable door prizes and a spin on the Spin-to-Win prize wheel! These units of blood are greatly needed as we enter the summer months when blood banks traditionally struggle to keep an adequate supply of blood on the shelves to meet hospital demand. Please join us as we prepare for any emergency needs.